If Hollywood execs ever decide to produce an Inauguration Crashers film, we know who they should call first. On Monday night, Gov. Gavin Newsom’s son crashed his inaugural speech as governor of California and the, uh, disruption was as adorable as it sounds. Two-year-old Dutch’s first onstage appearance was actually planned. Pacifier and blanket in hand, he accompanied his mom, documentary filmmaker Jennifer Siebel Newsom, and three older siblings as Newsom took the oath of office. The family left the stage when it was time for the governor to give his formal inauguration speech (alone), but Dutch wasn’t ready to give up the spotlight quite yet — so he took matters into his own hands and marched right back onstage. Newsom took the unscripted cameo in stride, picking up Dutch and holding him in his arms as he continued to read his prepared remarks off a teleprompter. “My wife Jennifer and I have four children and there’s nothing more important — I hope you can tell — than giving them a good and happy life. 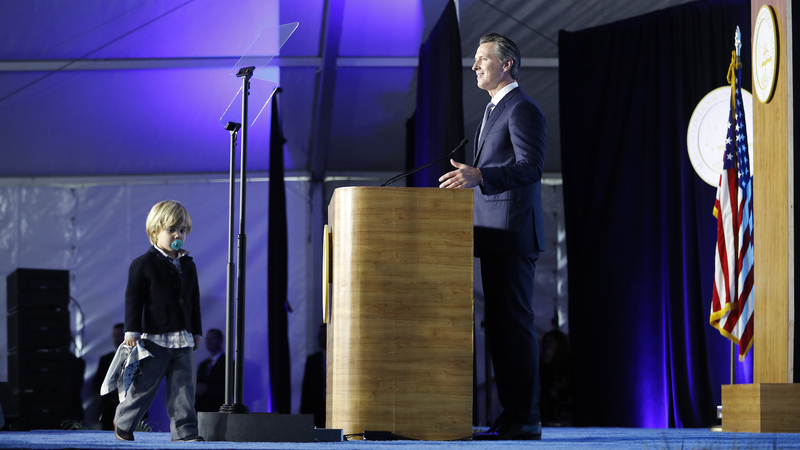 But all kids, not just the children of a governor and a filmmaker, should have a good life in California,” Newsom said through stifled laughter. After several minutes, Newsom put Dutch down and the tot proceeded to adorably wander around the stage as his mom and older brother attempted to coax him back into the audience. After some effort, they were finally successful — but with all due respect to Newsom, the speech wasn’t nearly as entertaining without Dutch onstage. “He’s a very rambunctious little boy, very cute. And I thought Gavin handled it very beautifully,” the governor’s aunt told CBS Los Angeles. Newsom has already stolen our hearts with his intelligent, compassionate policies and charisma — and seeing him share this sweet unscripted moment with his son totally made our hearts melt.